Merry Christmas from DT TALK! On this special day we’d like to share with you a gift, a DT gift. 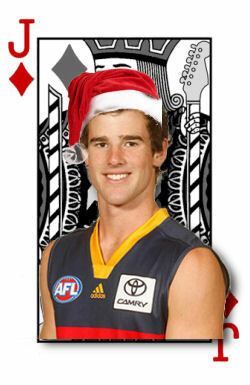 He’s name is Andy Otten and you don’t want to miss the boat on this guy as he is one of the biggest bargains of 2011. Our gift to you! Get on! Ho ho ho. and here is a little present from us to you, his name is Andy Otten! Why should I pick him? Because if you don’t… you may be missing one of the biggest bargains of 2011. He maybe the Michael Barlow (not in rookie form) of 2011. “Oh but Calvin… shhhh, he’s one of my boys”…. OH my, ha ha sucked in muppet, now everyone knows! . This is why he’s a must. Firstly, he’ll be mega rookie priced as he missed all the 2010 season after he went down during the 2010 pre-season with an ACL. He’s approaching his 3rd year and we all know what that means. In 2009 he played the full 22 games and averaged 68.5 with an average of 79 in his last 4 games for the season. Another bonus for this lad is that he was previously named as a midfielder but will play most of his footy down back in 2011, and we hope that is where he’ll be named, for DT sake. With Bocky gone, this will most likely be the case, although Andy did play a bit of a centre roll in 2010 and may get a run in there from time to time. Mainly because Andy is a bloody athlete. In the 2007 draft camp he ran 14.2 in the beep test with a vertical leap of 92cm which put him in the top 2% at the camp…. so he can jump and he has a motor, oh and did I mention he’s 192cm!! Why shouldn’t I pick him?Can he do it? In his 2nd year he did only crack the 90+ mark twice (9%) from his 22 games and did post some shockers with a 39, 43, 47, 49 in there amongst his worst. Plus, he is coming back from an ACL.. and this is never a good thing. Deck of DT Rating. JACK – Pure cash cow that might end up being a keeper, squeezing him into the QUEEN category (smokey). But this kid can play, he’s a tall dude with a motor, and at the price he’ll start at… trust me! This guy is a MUST for 2011… and a brilliant gift from us to you on XMAS DAY! !